Being more productive isn’t just about doing more. When it comes to productivity, if you're not thinking speed you’re missing out. If you're not following the 72 hours rule, then you are wasting a lot of hard drive space in your mind. There’s a saying in the marketing world that money is attracted to speed. That doesn't mean that you have to be a nascar driver or a motorcycle racer or anything like that. The idea is the faster you implement, the faster you prove out ideas, the faster that you do things, the faster the money will just start filling up your bank account. For example, in the book 22 Immutable Laws of Marketing, Jack Trout shares about the importance of being first to market. There is something about being the first, the first product or service, into the market place. If you can be first, you basically win. There is no catching you. Pepsi has never been able to catch up to Coca Cola. Coca Cola was the first soda. They still have market dominance. Miller Lite was the first light beer to the market with that, so even though they're not a dominant beer brand that Budweiser and Coors is more dominant, Miller lite was the first to get to the marketplace with light beer. Do you remember the commercials from the eighties? When it comes to your business and as a real estate agent, chances are you’re not going to be the first to market. If you have the idea, do it, do it. Get it out the door. Ideas don't make you money. Good intentions don’t give you progress. You can’t pay you’re bills by learning more and watching another webinar. You have to get the door and do. Back in January of 2012 I had a group coaching program where we did weekly live calls. And for a few weeks in a roll we kept hearing about the listing inventory drying up around the country. We could feel this real estate market shift, before the news or anyone else in the industry was saying anything. We could guess what was happening because of these weekly masterminds with real estate agents from around the county. Every week we're having these mastermind calls and the agents are saying there's just no inventory. So then we shifted and said, okay, here, here's how to go get more listings. I know some of them didn't take action. They didn't use the speed of implementation. If they would have at that time, they would have been able to get a ton of seller leads and positioned themselves with the inventory when a big supply of demand came. We knew it was coming. We could feel it a year and a half before you could see it. So what? What were you doing a year and a half ago? Were you implementing it or were you waiting to see what happens. Following. Where we think that we need every single piece of the puzzle in order to make it happen, but the fact is once you start something, once you’re going fast and start doing things, you'll find out quickly, what else you really need. Whereas if you're analyzing something, you're starting to add layers upon layers of stuff that you may not even need and stuff that's taking up your time and distracting you from your goal. Don’t worry about starting on the correct course. Get started and course correct. The longer you wait to implement, less chance you actually do. 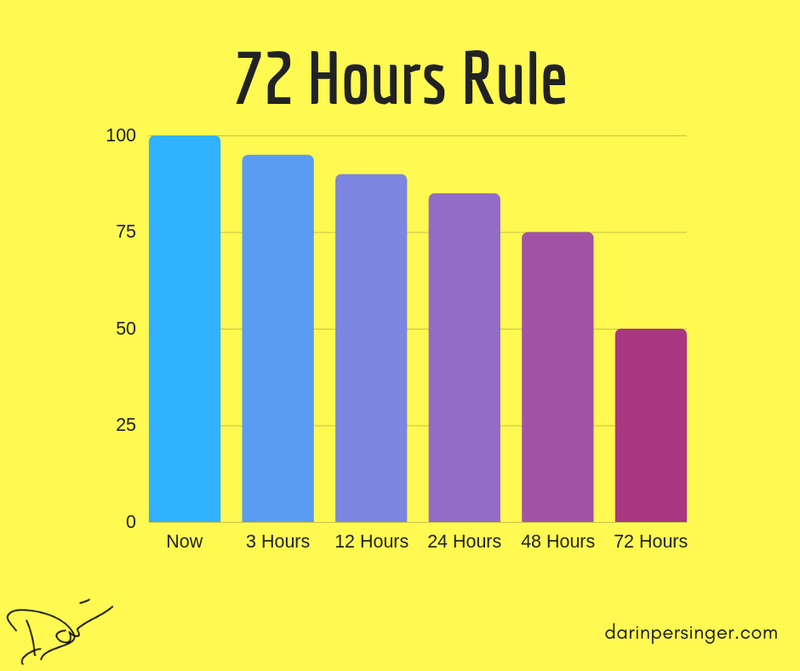 72 hours is the timeline where if you don’t take action the chances of you implementing diminish to zero. Let's say you're sitting around having a mastermind, a, a team meeting, whatever it is, you're listening to a podcast or reading this right now and you get an idea. If you don't do anything with it for 72 hours, you will do nothing with it ever. If you don't implement in three days, you'll never implement at all. Or you get stuck in a failure loop.